Although the scarcity of snow along the west coast mountains makes it seem as though we are still stuck in autumn, winter is in full swing in Yellowstone National Park. Last week I made a spur of the moment decision to join my friend and fellow photographer Raghu to look for wolves and other wildlife in the snow. Three years ago I had come to Yellowstone in the winter with my parents to see the geysers and wildlife, but we only caught a brief glimpse of the Druid wolf pack through high magnification spotting scopes. 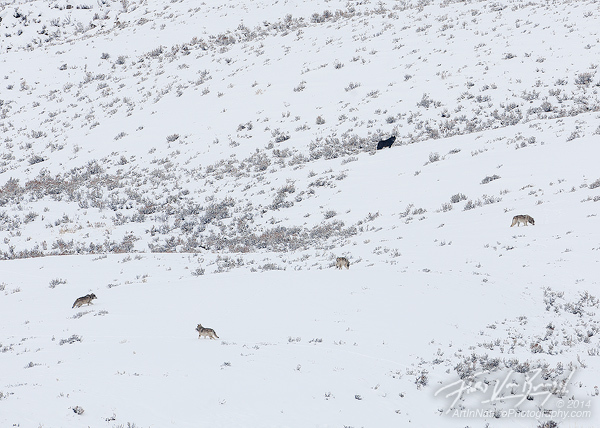 One of Yellowstone National Park's resident wolf packs (5 of 7 members in the frame) explores the snow hillsides of the Lamar Valley in winter. Once native to the area, the gray wolf (Canis lupus) was all but exterminated from the Yellowstone ecosystem by the Army, National Park Service, and ranchers between the 1900’s and 1940’s. As a result, the park saw an exponential increase in elk and coyote populations, which had a dramatic effect on the ecological balance. The plants were dying from over grazing, and the land was eroding. The park was being destroyed by its own booming wildlife population. The Park Service was forced to begin relocating elk, and even resorted to killing them, filling the former niche of the gray wolf. Between the 1960’s and 1990’s biologists urged congress to come up with a plan to reintroduce wolves to the Yellowstone ecosystem. Passing the Endangered Species Act in 1973 provided a legal basis for doing so, and after two decades of research and planning, 14 wolves were finally reintroduced into the park in 1995. To help keep track of the wolf populations in the park, approximately one third of the animals are fitted with radio and GPS collars. 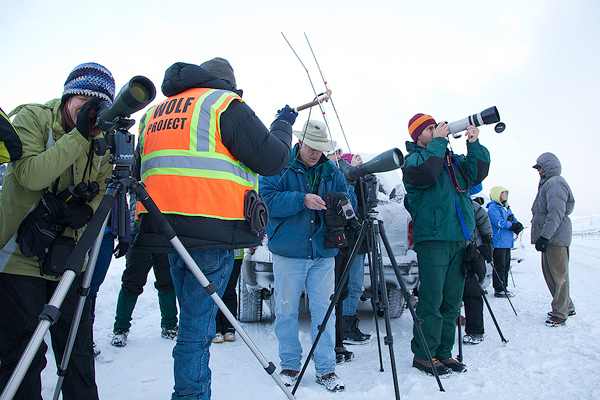 In addition to tracking the wolves for research purposes, park service officials help visitors see them by locating wolves with radio signals every morning. A wolf project official, surrounded by eager wolf watching tourists, listens to radio signals from collared wolves in Yellowstone National Park. Since their reintroduction, the wolves have done remarkably well, surpassing the population goal in 2002. Because of this success, in December of 2011 there were 98 wolves within the park, grouped in 10 packs. In May of 2011 the gray wolf was removed from the endangered species list in Montana, Idaho and parts of Oregon, Washington, and Utah, opening the doors to state managed hunting. According to the management plans, there are quotas for how many wolves can be shot in a given area throughout the hunting season. Wolves form complex family structures and packs, however, so the death of a pack member can have a profound effect on their social network. Just this past year several members of the Lamar Canyon wolf pack were shot and killed while roaming outside the park boundary. With only three remaining members, the alpha male (#755) was forced to leave his pack to find a suitable mate, as the only female left was his own daughter. 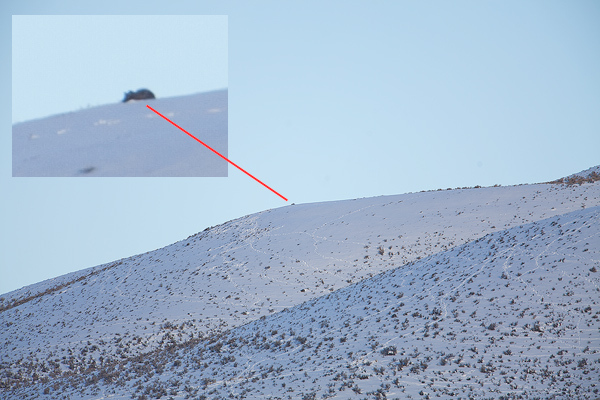 On our third morning, the wolf project officials had located the lone wolf, taking a nap on a distant hillside. The wolf, in the distance. The large image was taken with a 700mm lens (approximately 14x magnification), the inset shows the full pixel resolution, effectively 300x. You can just barely make out its ears. It was a beautiful morning, so Raghu and I decided to pack up and snowshoe up to a parallel ridge in hopes of getting a better view. After an hour of hiking, we spotted him, still peacefully sleeping in the snow! We set up our cameras (still about 1/4 mile away) and waited. Half an hour later, he lifted his head, stretched, and ambled off. As we later learned, his new partner (#889) was nearby, limping with an injured front leg. Perhaps he had gone to help her out. 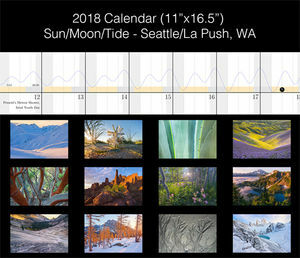 On our final day – New Years Day – we were off to a late start because of the snow that had fallen overnight. While driving down the icy roads of the Lamar Valley in the predawn “blue hour,” I saw a car with its flashers on up ahead. I slowed down, and suddenly we spotted a beautiful black morph gray wolf slink away from the road. Quickly I grabbed my camera and fired off a few images, resting the lens on the window sill. It was very dark, but after coming home I was delighted to see that one of my 1/30th second exposures was satisfactorily sharp! The wolf turned out to be the daughter of the former alpha male of the Lamar Pack, and was one of the few un-collared wolves we had the privilege of seeing. She, and her partner, had killed a female elk right by the side of the road overnight. Most of the “wolf watchers” had arrived so early in the morning that day that they had driven right past them in the dark – thankfully we had a late start! 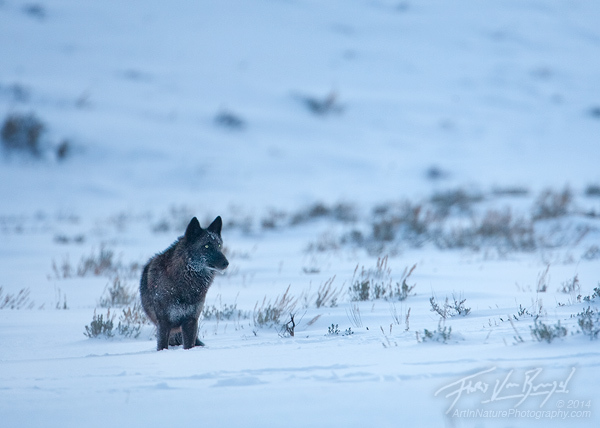 A gray wolf (Canis lupus), a member of the Lamar Canyon pack, poses in the pre-dawn light in the Lamar Valley of Wyoming's Yellowstone National Park. The wolves often catch up to their prey near the road, as the elk head for the river to increase their chances of survival. 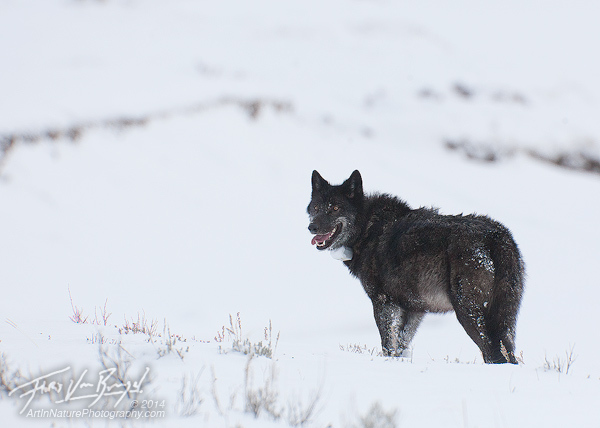 However, when approaching or crossing the road they stumble, giving the wolves an opportunity to catch up. Because wolves are naturally skittish of humans, they abandon their kill as soon as there are people nearby. To give them a chance to finish off their kill, the park service will often move the carcass a safe distance from the road. Although the wolves rarely return, other scavengers have no qualms coming in to finish off the job. We spent the rest of the day waiting near the kill, in hopes of some excitement. That afternoon, the handsome gray colored wolf (#755) and his injured partner (#889) made an appearance across the valley. I watched through my binoculars as they traversed the valley, making characteristic zig-zagging maneuvers indicative of scent tracking. They were coming in to feast on the elk that the other wolves had taken down during the night – the injured wolf was probably in desperate need for a meal. I can only imagine what it must be like to have a nose that can smell a frozen meal from two miles away! 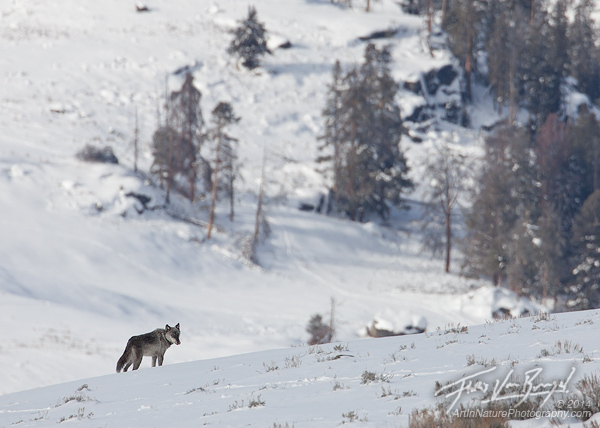 A hungry gray wolf (Canis lupus) pauses for a moment while on its way towards an elk carcass in the Lamar Valley of Wyoming's Yellowstone National Park. Many of the wolves in Yellowstone are fitted with radio, or GPS, collars to help track their behaviors. This one sports one of the newer GPS collars. As she approached, she gave us exceptional views, at one point coming too close to photograph with my 700mm lens. Her partner, the handsome gray wolf, was more shy, and stayed farther back. She cautiously approached the elk, had her fill, and joined her partner to wander back into the woods. Hopefully a full belly will allow her leg to heal in the coming days. 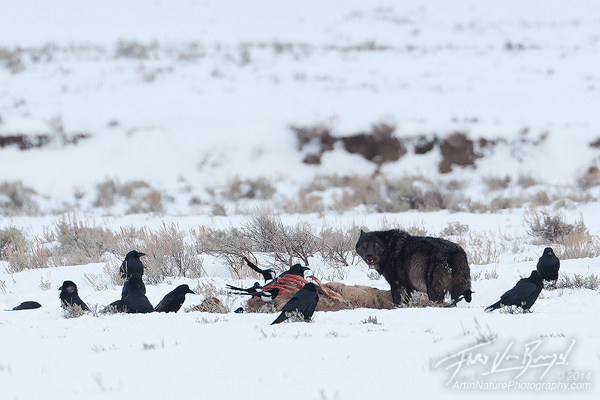 A gray wolf feasts on an elk that was killed by other wolves. This concludes our incredible and unexpected encounters with wolves this trip, however, I have many other images of the other wildlife that I look forward to sharing next! I hope everyone’s 2014 is off to a similarly great start. What a great encounter. Looking forward to more! Amazing images, Floris. I especially like the dawn image, amazing that you came away with a good image in that wonderful, but dark light.